I have a tin of chick pea and was wondering what to do with it. Though of opening the can and nibbling on it but that has changed with the presence of your recipe. Lovely healthy food with nice flavors but need to change because I may not have some of the ingredients. Yum. Salam Ridwan, looks rich with chick pea. My bloglist not updated my entry. Pls visit my latest entry. Thanks. Ridwan, I love your creative, colorful, light and delicious chickpea salad. 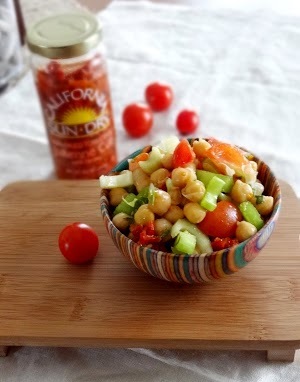 I have not made a chickpea salad in a long time...I'm looking forward to try your recipe! Love the addition of the sun-dried tomatoes and the honey to give a touch of sweetness with the combo of the spicy red pepper flakes. I'm crazy about chick peas! This looks fabulous!